Does not require a barrier for use in hazardous areas, it is Flameproof, making the barrier redundant. To mount encoder on machine: Option 1 is to mount with 3 screws or, option 2 is to mount using synchroflange mounting brackets. Hook up the encoder with the connections as described. Make sure power supply meets specifications. Attach encoder to mounting bracket as shown. 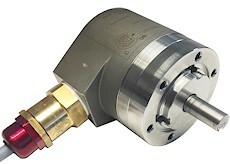 Attach shaft using a flexible coupling.